I'm looking for a "Request for Proposal" template to send to Architect, Design Consultant, Engineer and General Contractor for a potential condominium development I am considering. Would also be nice to see a sample detailed construction workplan (to get a reality check on the actual time it may take to complete the development). I don't have Request for Proposal ... in fact I have never heard of one. If I understand what you are getting at, what I do is go out and interview the people I want. Understand all professionals have specialities ... there are guys I would never engage to design an office building, because what they do is condos; townhouses; hi rise apartments. So if it's condo you want to do research the architects who do that stuff ... then go and have a look at what they have finished ... style etc ... is it in keeping with what you like. I cover all this in my ebook. I also include a Development Work Flow Chart or as I call it a Road Map. A sample detailed construction workplan would not help you, because it is specifically for an individual project. It is also as an experienced developer something that builders work to ... not me. 1. Have a View of what the market wants. 2. Manage the professionals to achieve the goals he wants within time and cost. but it's "his plan" to achieve the completion of your project in the Time and Cost he contracted with you. 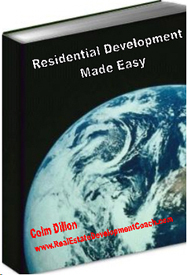 If you are contemplating a development I recommend you invest in my ebook - it is the nly one written on the topic and will help you get on track. Thanks for your response. I will go and check out your book. Do you have a pre-acquisition due diligence checklist in the book as well? It would just help as an additional comfort that we haven't missed thinking about something. Regarding the sample workplan, I was just trying to get an idea around realistic timeframes for a couple of projects we are considering. I know each project is unique, but thought it might give a little guidance. I have done large scale project management in some other fields, so I was just trying to ballpark some time frames for our projected ROI calculations. Thanks for insights and help. The ebook covers preacquisition in narrative form rather than a list. I have written the ebook in a conversational style to try and let my readers see between the lines. Now I do have lists, but they are more concerned with the component parts of a Feasibility Study and a brief description of each component. Now it may help you to know that for readers who need some continuing help I carry on an extensive correcpondence answering their questions or just helping them sort out their thoughts. So don't feel you are on your own and I will be pleased to extend the same help to you, until you get on your feet. I don't charge anything for this ... but it is offered where people feel their is a need. I have the advantage of my background, questions coming to me from around the world and being semi retired, you could say that my ebook and helping people succeed is my main job these days ... AND LOVING IT! So there you are P ... I hope that helps you a little. Thanks a bunch for your help and your offer to help in the future. I will most likely take you up on that offer.